500 installations in just 3 years!! Intelligent Streetlight System in Pune. What makes Layman wondering about SLC 03 GSM. What News Papers talks about us. The unit consists of two systems IU 802 AP 1- 3 andIU 802 HP 3 - 3 refrigeration systems, 12 sample container of 5 liter carboy, sample distribution solenoid vales, sample flushing solenoid valves and peristaltic sampling pump house temperature sensor for incoming sampling line, house in a sturdy industrial M S box with powder coating cabinet and Refrigeration compartment with in S S.
It also designed with the computer in RS 485 connectivity and software for temperature data and parameter updating from computer. 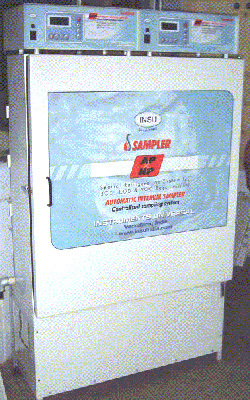 The unit also has facility of homogenization of collected sample. We request you to visit our site of street light controller for energy saving in street, plant and compound lighting. Copyright © 2007-2014. Instruments Universal. All Rights Reserved.